Since today is my mom's birthday, I decided to dedicate a post to her. (Hi, Mom!) Moms teach us a lot of lessons, whether they mean to or not. Here are some that I've learned from mine over the past 22 years. 1. Be independent. Go to the store by yourself. Support yourself financially. Being a strong, independent individual is important in life. 2. Be assertive. Stand up for yourself and go after what you want. Good things come to those who work. 3. Value your education. Many people don't have access to education, so it's important to value yours. Strive to always keep learning, even outside of school. 4. Accept change. The world is not a stagnant place, it's constantly changing. Accept and welcome that fact, and you'll handle it much easier. 5. Don't strive for perfection. Always try your best, but an endless pursuit for perfection will not end well. Set goals and standards for yourself, and be sure to always be happy with your work. 6. Eat cereal whenever you want. A whole new world will open up to you when you accept that cereal is not just a breakfast food. I honestly think we eat cereal for dessert more than we eat it for breakfast. 7. Always bring a jacket. Enough said. Take some time today to talk to your mom and let her know how much you appreciate her. 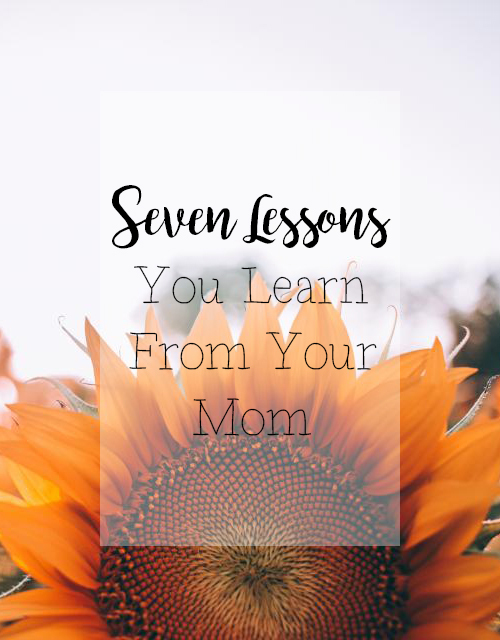 What are some great lessons that you've learned from your mom? Right?! I never like having to haul a jacket around, but sometimes you never know when you're gonna need it! Closet Confidential Tag: What Do I Wear?